Yes, I name my computers. That’s not the sad part; the amount of time I spend finding the right name, now that’s the sad part. Anyway, this is my MacBook Air review. But before I tell about my 11-inch MacBook Air (AKA Bullet), I need to tell you about my late 2008 MacBook unibody (AKA Mustang). I haven’t been as happy with an Apple product since the original iPhone. Yes, this includes the iPad. Think I’m mental? Well, you have no choice now but to read on then. 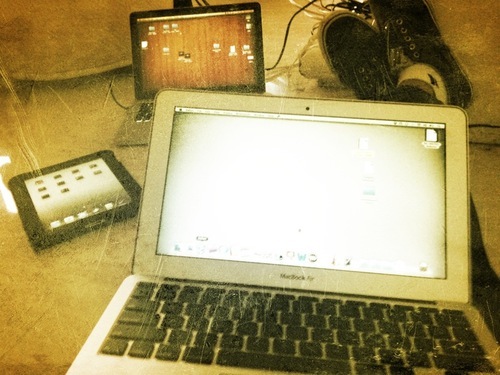 The unibody MacBooks almost ruined my geek-creed within my analog friends. I made them all hold their laptop purchases for more than a year, ’cause a new metal MacBook was coming. By the time it came out, my 1st-gen white MacBook was ready to become a media center and I was ready for a replacement —my powers of self-delusion are ridiculous. Mustang was named after the WWII P-51 fighter-plane: sleek, big and shiny, with great power and long range. It must be said that I absolutely … held this MacBook in high regard. As in a typical romcom hollywood flick, I just could never say the L word about it. Mustang did what it had to do, it looked great doing it, but the sparks just weren’t there. The battery life was a disappointment, and while I had maxed it out with 4GB of RAM, it didn’t feel any faster than the year old stock white MacBook I had at work. Fast-forward two years —preset time for my inner upgrade cycle alarm—, and I caught myself checking store.apple.com and, surprisingly, feeling underwhelmed. Other than a remarkable increase in battery life, there wasn’t all that much that had changed on with the MacBooks2. When my pal Nav bought his Macbook Pro 15″ 2.66GHz i7 with 4GB RAM, and commented that it was more powerful, but not really faster —think iPhoto launch time vs. time to apply an effect—, the idea of buying a new MacBook was discarded. Yet, it had been two years! a tradition that started with my first Mac, an iBook G3, had to be upheld! —told you above, ridiculous. The consensus online was pretty clear: SSD is the next speed jump — friends and relatives, you’ve been warned, this is going to be my subject title for all your computer purchases questions in the next year. So Mustang was upgraded, not replaced. An 80GB Intel X25-M SSD was brought in as the main disk, and the DVD drive was ripped (killing my speakers in the process, mea culpa) with the original 250GB HD installed there. The result? a veryvery —not a typo, it’s veryvery— fast new MacBook. It feels twice as fast, boot and app launching times more than halved. And while I haven’t done a scientific benchmark, the battery life for Web browsing has improved a good 20 minutes. If it weren’t for my MacBook’s bad habit of not waking-up for sleep, everything would great. It was love at first tech specs reading. I bought my MacBook Air before they where on display at the Apple Store. The guy even asked if I didn’t want him to bring one out just to compare the 11-inch and 13-inch. I said no. It was just like the movies: I had $999, he had a MacBook Air in stock. Nothing more was said. Well, actually, my bank had something to say: card denied. But after convincing the nice lady on the phone that I, was in fact me, and me really wanted to buy I a MacBook Air, everything was fine. Bullet was born during a trip. So in a way, it hit the ground running. And this little guy can run. My concern for getting the base machine —1.4GHz, 2GB RAM and 64GB SSD— quickly went away. I’m not delusional, without Mustang waiting for me at home, I wouldn’t have been able to justify3 such a constraining machine. Just my iTunes are iPhoto libraries are at least 64GB. But as a sidekick, this machine is a dream. Did I mention it was fast? For 80% of my tasks, it’s blindingly so. Battery life? I just charge it when I get home, it lasts the whole day. Portable? it’s even easier to carry than the iPad. Looks great? Pluh-ezzz. Better than the iPad? I, uh, err, hmmm … please step into my office. When I got my iPad, my Kindle glared at it. When I brought the MacBook Air home, it did the same. In both cases the same thing happened, what had been a huge theoretically a dilemma in my head, turn out to figure out itself naturally when I had the devices in front — or in a bag. The iPad didn’t take over reading on the Kindle, it just segmented reading in two: superficial and in-depth. I use Instapaper in both, anything short and time sensitive, gets consumed in the iPad, the rest falls into Kindle territory. Interestingly, my overall reading time has increased. Replace reading with working —browsing, email, writing—, and Kindle with MacBook Air, and you get my new dynamic. What I’d thought was going to be a duplication of functionality turned out to be a specialization of tasks. I hear you, it sounds like an expensive pairing, but I’d argue that not so much. An iPad + MacBook Air combo runs into the same price range of a much more versatile MacBook Pro. But, for non-video-editing-mostly-email-Textmate-Keynote-and-Excel user like myself, two devices that do more specific tasks could be a better option. What a about Mustang? It has basically become a glorified iMac. Paired with a 22-inch monitor it’s a perfect desk computer. Yet, I still keep reaching for Bullet in my bag sometimes (even though everything is synced with Dropbox). If I had to choose one computer, Mustang would become a media-center faster than you can say Boxee. What would I miss? more space to hold my digital baggage. External HD’s don’t seem optimal with the current generation of MacBooks Air’s since USB 2.0 speeds are not fast enough. But, what if the external drive is a huge datacenter in North Carolina? Interesting possibilities open up. At the end of the day, the 11-inch MacBook Air represents the reasons I bought my first iBook G3, with the added benefit that it now can do everything I dreamed an iBook could, in an affordable package.